Due to sedentary lifestyle, bad eating habits and hereditary lifestyle people develop disorders like high blood pressure. In this therapeutic diet, we restrict sodium content intake by prohibiting foods that have excess sodium content in them. Added salt to food is banished for you. Instead you are allowed potassium rich foods which help in neutralization of sodium. Low sodium salt may be an option. Diet Clinic prepares diets after proper consultation with the patient; therefore diet works differently over each patient. 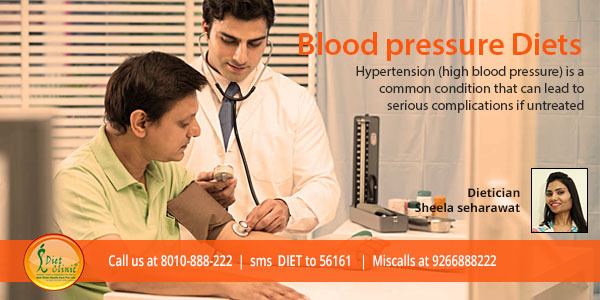 ypertension (high blood pressure) is a common condition that can lead to serious complications if untreated. Making dietary changes and losing weight are effective treatments for reducing blood pressure. Other lifestyle changes that can help to reduce blood pressure include stopping smoking, reducing stress, reducing alcohol consumption, and exercising regularly. These changes are effective when used alone, but often have the greatest benefit when used together. Hypertension is known as the "silent killer" and is one of the most common diseases of the cardiovascular system. It is defined as a condition of sustained elevated pressure in the arteries of 140/90 or higher.High blood pressure may sometimes be secondary to diseases of kidneys or endocrine glands like the ovaries, suprarenals or pituitary; this may respond to treatment of the cause. We don’t ask you to make big changes in your diet all at once. We will work and make small changes, and don't give up. As soon as those changes become habit, add a few more changes. You'll have more success as you do our Diets program which includes long-term and short-term goals as well as ideas for getting past barriers-things that might get in the way of changing your eating habits. Support from our Dieticians can go a long way toward helping you find success in changing your habits & lifestyle. Reduce your stress as much as possible. Practice healthy coping techniques, such as muscle relaxation and deep breathing. Getting plenty of sleep can help, too.